Construction has now started for our new practice court facility for the 2016 BB&T Atlanta Open. 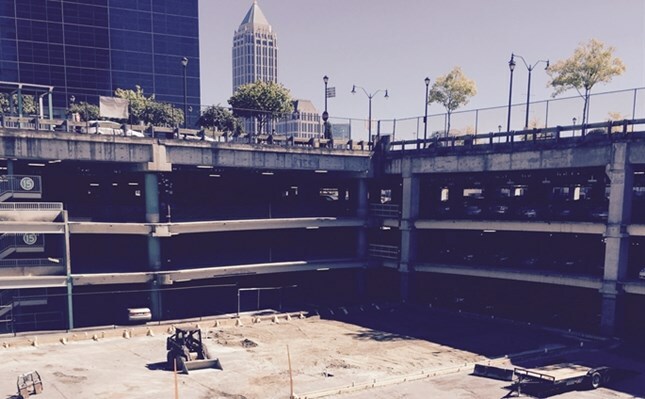 The new courts will be located approximately 50 yards behind the original third match court alongside three practice courts inside the Atlantic Station parking deck and adjacent to the Twelve Hotel. Usage for the new courts will remain the same as tournaments past with the BB&T Atlanta Open Local Wild Card Challenge, sponsor clinics and player practices to be held on four courts in total. “We have had feedback in the past from our fans not knowing how to get to the practice courts from our main match site.” Tournament Director Eddie Gonzalez said. “Now, Fans will have easy access to the practice courts just steps from our Family Zone area within Atlantic Station.“ Additionally, our ATP pros will have an even easier time getting to our practice facility located directly outside our player hotel, the Twelve.” Leveling of the construction area has begun and will continue for the remainder of 2015. In the spring, Signature Tennis Courts, Inc. will come in to pour concrete and finalize the courts by late April. “What a great practice set up to watch the Bryans, Roddick, Isner, or whomever while you walk around Atlantic Station to eat and shop. “ Gonzalez added. So what happens to the original courts? Plans are under way by developers for another high-rise to be built comparable to The Atlantic Condos/Residences adjacent to the current practice courts. The 2016 BB&T Atlanta Open will be July 30 – August 6.